First impressions are powerful and lasting. This carries over into medicine big time. Once we become accustomed to a certain test or treatment we feel deprived when we don't have access to them. 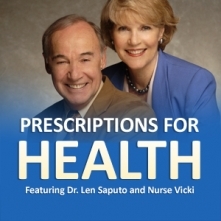 Dr. Len and Nurse Vicki review examples of this that include mammograms and breast thermography, drugs and infrared light therapy, routine lab testing and BioEnergy Testing, dead cell analysis and live blood cell analysis, and chemotherapy and CAM approaches to treating cancer. First impressions are similar to "branding" a product...the first company that develops a product successfully will enjoy a long life of sales. At a psychological level, we tend to defend what we believe and ignore most anything that is different when it is initially presented. When there are conflicts of interest, especially when they are financial, there is usually even more effort made to protect against change that could compromise income.